W.S.C. 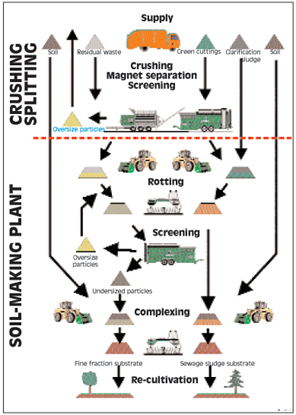 process allows the redevelopment of surface constructions and landfills! Biogenic waste and soil is the basis for earth with locally specific characteristics. The creation of a closed cycle is a fundamental objective of every progressive waste management system. As a rule, when surface constructions and landfills are to be re-cultivated, the objective is to re-establish the original or an adapted landscape. For this purpose it is necessary to return the original soil substance to the damaged landscape as the basis for planting. Over a period of up to 20 weeks, the W.S.C. process creates a precisely defined uniform substrate which is allocated to a specific use after end-product inspection. Gaseous emissions from the body of a landfill are decomposed on their path through the layers of substrate, and seepage water is minimised through a steady water balance in the living cover layer. - Provision of manuals, measuring equipment, computer software, etc.